Mobile Ready! Generate quotes on the road! Full trial with all functionality except a watermark. Get Paid to your PayPal account. 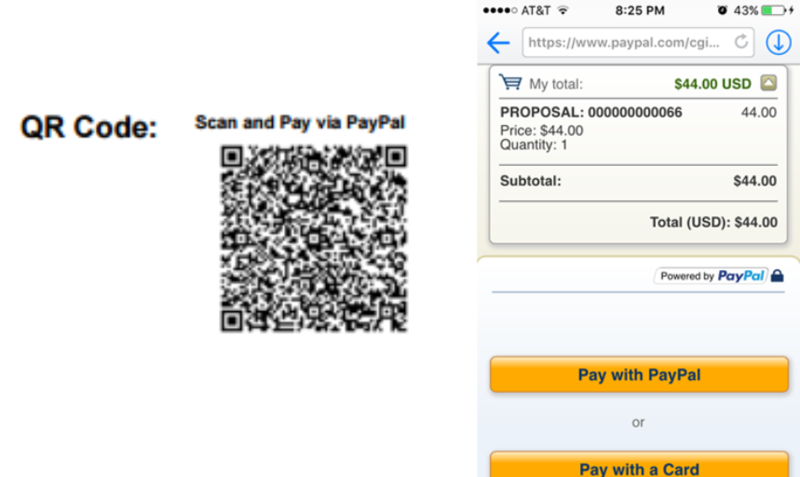 Program adds a QR Code to PDFs that can be scanned to creates a PayPal invoice. Have PayPal? Program adds a QR Code to your document so you can get paid via PayPal. Createt Job Quotes, Estimates, Bill of Sale, Late Notices & More. Generate Quotes, Estimates, Invoices, Late Notices & More! This software service allows you to create many types of electronic documents. Create various documents for all your job needs. It's easy, simply register and sign-up for $9.99 a month or try for free. Setup your customer and start generating PDF documents of various types. This is designed with the small business owner in mind. Create fast workflows when job prospecting. Setup a customer then create a quote, invoice, bill of sale documents & more. Email your PDF documents to your customer. We provide a quick way to send your prospect a quote, estimate or bill. This makes more money for you. Get the job faster and make more money. Add your PayPal account name in the Company Setup page and all your PDFs will contain a QR Code on them. Your customers can scan the code via a smartphone QR Code reader app. When scanned the code will take the user directly to PayPal website for invoice payment.